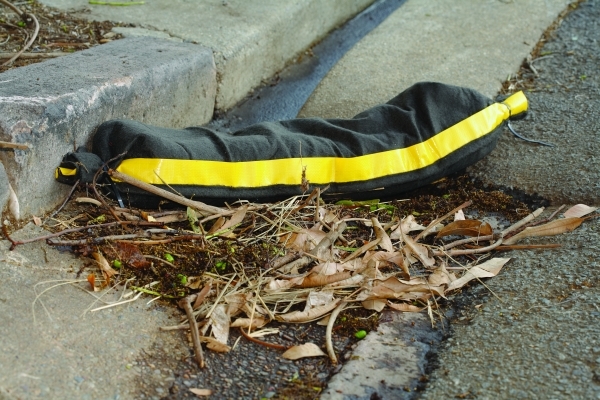 The High Visibility Silt Sock prevents silt run off into stormwater drains and off driveways or construction sites. Place it along a gutter or around the drain inlet. Simply cut off the required length, fill with gravel or sand and cable tie the ends. The Sock is made from non-woven polypropylene with a high visibility strip sewn down one edge. It can withstand some vehicle traffic and comes unfilled in an easy to use roll or pre-cut 4m sections. Filters particles as small as 120 microns. • The Sock is for silt control not hydrocarbon or chemical spills. Use instead appropriate booms. • Cut and fill on-site for easier transporting and dispensing.